The Hillsborough Jr. Raiders is an independent recreational youth organization serving the community of Hillsborough, NJ, since 1992. The Jr. Raiders offers organized youth activities in flag and tackle football, cheerleading, track & field, girls lacrosse and field hockey for youth in grades Kindergarten through 8th. We are committed to teaching the children the skills they need to have fun playing in a safe environment. Our players learn and apply the principals of sportsmanship, teamwork, discipline and dedication. The Jr. Raiders offers opportunities for boys and girls of all skill levels. Our philosophy is that all children need to get into the game to learn and have fun. We emphasize the fundamentals and progression of skill development, which will prepare them to participate at higher levels of competition as they progress through the different levels within their sport of choice. The Hillsborough Jr. Raiders provides Hillsborough High School with student athletes that are prepared for the next level of competition and education. Our fall Cheerleading program has squads that provide spirit for our football teams and Competition squads for girls who want to take cheer to the next level. Each level of football has an associated group of cheer squads. The competition squads cheer for the JR Skyland teams and also compete in individual meets and competitions throughout the NJ area. We are extremely proud of the awards and major achievements of the squads. Look at our numerous achievements under the awards and championship section of the website. Our mission is to teach individuals to be exceptional cheerleaders, but most of all, to be exceptional people! 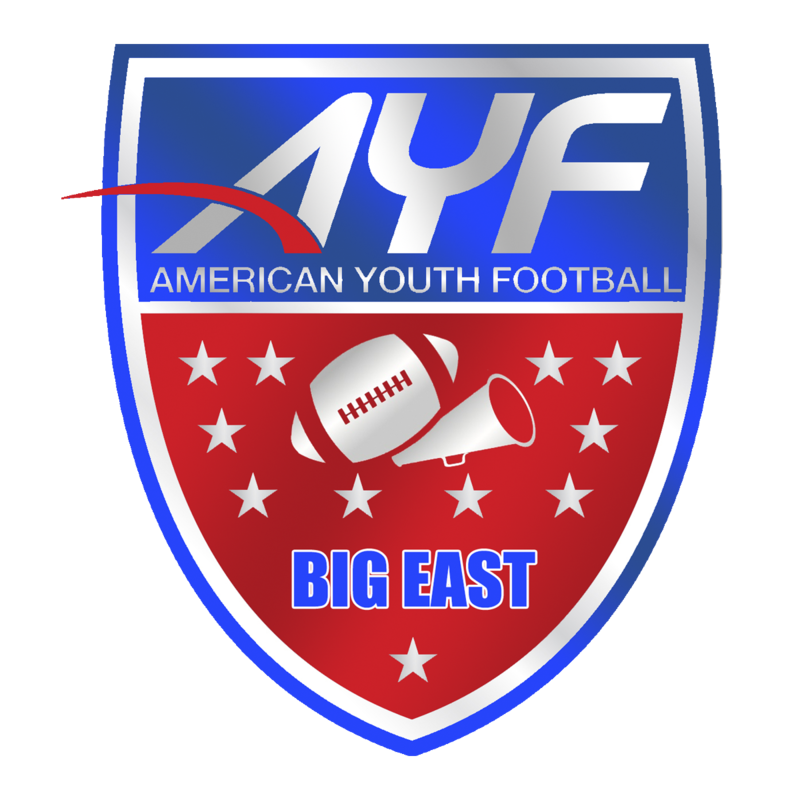 Our fall football program participates in the Greater New Jersey AYF Conference, the largest youth football conference in the nation. We offer two levels of play. The Delaware Division offers 9U, 11U and varsity teams and will play home games at the Triangle Road Football Complex on Saturdays during the day. Competition consists of like-minded conference programs ending with a local conference championship. Select athletes will play for the 11U and Varsity elite teams in the Raritan Division. These select teams play Saturday nights under the lights at Hillsborough HIgh School. Raritan division teams compete with other in and out of conference AYF programs and are made up of more experienced athletes. Raritan Division conference champions will receive an invitation to continue play through regional and national playoffs. The Greater New Jersey AYF conference was formed in 2018 by member organizations from the Jr Skyland Conference. The Spring Track & Field program is an in-town program that focuses on teaching our youth both the field skills and the techniques for running sprints, relays and distance. The program is a member of USATF and our athletes will compete in various local and state meets based on the individual’s capability and advancement. Our Girls Lacrosse Program runs in the spring and has had great success in its first few years. The program participates in the New Jersey Girls Lacrosse Association (NJGLA) and follows the guidelines for sportsmanship and coaches training set forth by the association. The Girls game is fast paced and exciting, we offer instructional level, U9, U11 and U13 divisions. The games are played at the Triangle Complex. We generally practice 2 days per week and have 2-3 games per week during the season. ​Our fall field hockey program is in its third, successful year. We are EXTREMELY proud of all of our players, coaches, jr coaches and parents who have all made this program what it is today! Our mission is to instruct, encourage and enhance the skills of all of our players Grades K-6, moving them into their continued success in middle and high school. Our Mini Chix (K-1) clinic is run weekly by seasoned coaches and high school players. They work on basic stick work, safety awareness and move into game-play situations during the season. Our Little Stix (grades 2-4) and Junior Stix (grades 5-6) participate in the NJPA instructional league, playing other teams in the league that have the same skill set they attend practice twice a week with games on Sundays, all at Mr C East, Woodfield Park. Our coaches have all taken the Rutgers S.A.F.E.T.Y. Program and must pass background checks. Football coaches and players are members of USA Football and the coaches must pass basic knowledge tests in order to coach at any level. The JR Skyland conference employs NFHS certified football officials and EMT at each event. The Hillsborough Jr. Raiders is sustained by the efforts of its volunteers. We are governed by a Board of Trustees. Current volunteer members of the Board of Trustees (the Board) are Co-Chairpersons Jamie Moore and Bob Lawton, Treasurer Mary Riccardi, Secretary Jerry Donoghue and Trustee at large, Irene Minetti. The organization’s day to day operations are managed by the Steering Committee which is comprised of a group of program directors. It is dedication and hard work of our many volunteers that makes the Jr. Raiders the exceptional organization that it is today. We are always looking for new volunteers to help with coaching, directing, being a team parent, trainer or just lending a hand. See our contact page for ways to reach the appropriate person or area of interest. Hillsborough Jr Raiders Sports, Inc. does not authorize the use of email addresses from this site or any group or team mailing list for commercial or unauthorized use without express permission. Further, we only endorse companies, private label programs and fund raisers that appear on this site or through our other linked accounts. If you wish to participate in any of our programs please contact the Director of Cheer, Football or vendor management for review prior to emailing anyone from this organization. The Hillsborough Jr. Raiders Sports, Inc. is a 501(c)3 tax exempt organization.